Get it all with a few good stories from your happiest customers! The first book on capturing and using customer stories to grow your business or cause, Stories That Sell introduces a proven process for leveraging your current successes into new sales. Learn Success-Story Marketing™ best practices from author Casey Hibbard, leading expert on creating and managing customer stories, with insight from organizations such as Sage Software, SAP, Toyota, Kronos, Amdocs, Make-A-Wish Foundation, and dozens of other businesses, independent consultants, and nonprofits. Profit from the one marketing tool prospects believe most! Stories That Sell introduces a proven process for creating and using customer stories. 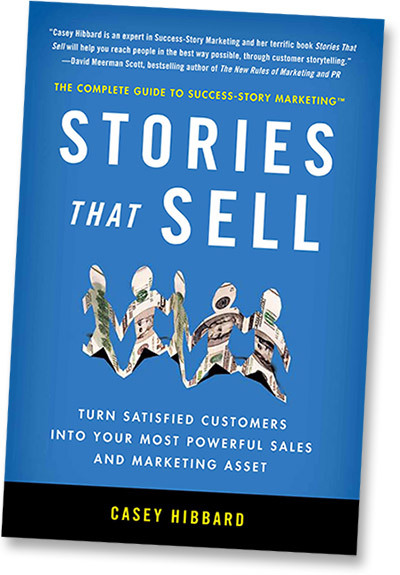 The Marketer’s Customer-Story Toolbox – PDF companion to Stories That Sell with resources to help marketers, business owners, and others managing customer stories. The Writer’s Customer-Story Toolbox – PDF companion to Stories That Sell with a wealth of resources to help case study writers. If I’ve learned anything, it’s that others say it much better than I can. Writers, marketing managers and business owners have weighed in on Stories That Sell, and the response has been overwhelmingly positive. “For decades, marketing has professed the power of the testimonial. It makes perfect sense. Word of mouth buzz has always been more potent than paid advertising. So why not amplify the power of a single customer’s experience by sharing their compelling story? As is true of many things—easy to say, difficult to actually do well. That’s where Casey Hibbard’s book Stories that Sell comes in. It’s like a crash course on how to capture and share your customer stories in a way that evokes trust and inspires buying action. Buy from here today and get your two bonus ebooks, only available here. Purchase of any type of Stories That Sell includes bonus downloads: The Marketer's Customer-Story Toolbox and The Writer's Customer Story Toolbox — only available for buyers on this site!